2 Color Auto Printer for contact lens(WE-9149-2) - Guger Industries Co., Ltd.
Tube type feeding/collection for saving labor cost. High precision positioning device give perfect printing. Easy adjust the plate with micro-adjustable base. Clear printing effect & no pollution by imported ink cup. 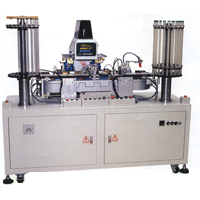 16 Section indexing device is used for easy quality checking and dry. The printing object can be took out from the fixture during the printing operation. PLC control, easy operation & maintenance.